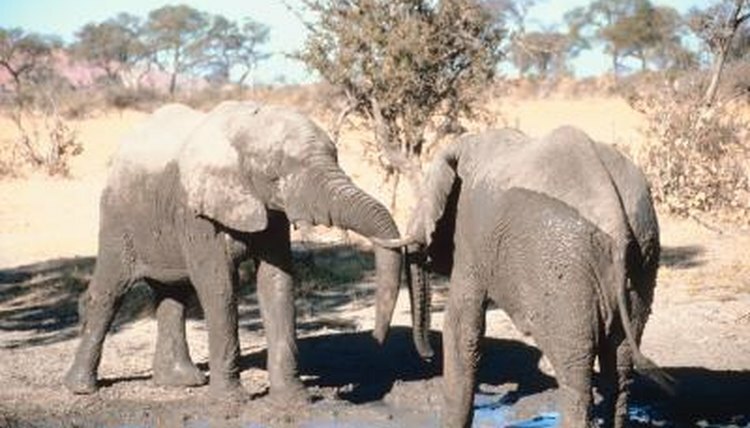 Dry weather makes life difficult for animals of all sizes, but for huge animals such as elephants, a lack of water can seem to be an insurmountable problem. Despite the harsh living conditions created by a drought, nature has equipped elephants well to be able to survive and to find water. Elephants may use one or more methods to find water, depending on the conditions they find themselves in. The average adult elephant drinks about 40 to 60 gallons a day, usually from rivers, lakes, ponds or watering holes. He squirts it into his mouth from his trunk one or two gallons at a time, and he will often stay by the water until he has drunk his fill for the day. When there's enough water available an elephant will squirt it over his back to help to him stay cool. If water is in short supply, he may take a dust bath instead. Elephants that live in areas where the baobab tree grows are able to use this tree as a source of water. These huge animals push the trees with their heads or rip at them with their tusks, breaking the trees open. Inside the trunk of each baobab tree is a reservoir of water, which the elephant quickly drinks up. How many trees he has to open depends on the overall weather conditions, the size of the trees and how much water is stored in each. If they are in a very dry area, especially if the drought has lasted for a long time, elephants will sometimes migrate to other areas where water is more plentiful. They typically only migrate as far as they must to find food and water. If the drought area is fairly small, the elephants usually don’t go far. When the drought covers a large area, elephants will travel to much more distant areas, often staying there until rainy weather arrives. Elephants help not only themselves but other animals as well when they dig into dry stream beds or other spots to uncover water that is lurking below the surface. They often create very large holes by digging with their feet, trunks and tusks, working until they reach an adequate supply of water. When the elephants are done with the water, other animals come to take advantage of whatever is left behind. These holes also provide the elephants with a source of mud, which they scoop up with their trunks and spread over their skin as protection from the sun and biting insects. How Long Can African Clawed Frogs Stay Underwater? What Kind of Shelter Do Anacondas Live In? How Heavy Is an Elephant? Do Hedgehogs Need to Swim?